See, the thing is, I’m whatever the step is beyond ADD and am afflicted with a sitting attention span of about 20 minutes. Not really a good thing for a writer. After a while, my large muscle twitches begin to contort my body into a sort of macabre computer chair dance that makes bystanders think I’m petitioning for rain. So I get up, go wash some dishes, put on a load of laundry, do a lap or two around my writing cave and get back to the keyboard for another 20 minutes. After a few rounds of this, I’m ready for a change of scenery so I take my first prayer walk of the day. One of many. 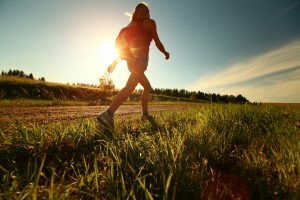 What a pleasant surprise it was to see this article that reinforces that prayer walks are not only good for you spiritually and emotionally, but physically too. And if you add prayer to the mix, walking helps strengthen the heart in more than one way; it floods the darkest chambers with light and droughts of fresh air as Papa God blows out the cobwebs with His sweet, refreshing presence. Can’t beat that for a bonus round! So I encourage you to join me today in at least one prayer walk. We can put our twitching muscles to good use, retire the rain dance and maybe even avoid a flood.